After opening with scores of 71 and 68 on the Kings' Course, Shimp added an even-par 72 in Saturday's last round and tied for 22nd at 5-under 211. His top showing for the Cardinal is a tie for 20th last year at The Goodwin. 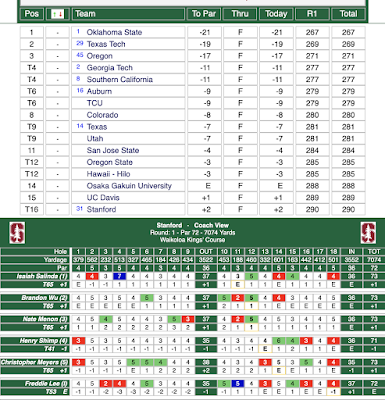 Stanford placed 13th in the strong 18-team field, improving one spot from Friday. The Cardinal registered scores of 290-284-292 to conclude at 2-over 866 in its first tournament of the spring season. Top-ranked Oklahoma State won with a 47-under total of 817. "We didn't have our best stuff this week but the guys hung in there until the very end," said Conrad Ray, the Knowles Family Director of Men's Golf. "We have been working hard so the results will come." Shimp was Stanford's most consistent performer. On Saturday, he made three birdies and three bogeys. Senior Brandon Wu had his best round of the tournament with a 3-under 69 and tied for 30th at 3-under 213. He fashioned a team-best five birdies. Sophomore Nate Menon (78) tied for 75th at 6-over 222, followed by senior Christopher Meyers (74), who earned a share of 81st at 7-over 223. Senior Isaiah Salinda (77) recorded his second eagle of the event on Saturday and placed 81st at 8-over 224. Competing individually, freshman Freddie Lee (72) tied for 72nd at 4-over 220. Matthew Wolff of Oklahoma State was the medalist at 18-under 198. 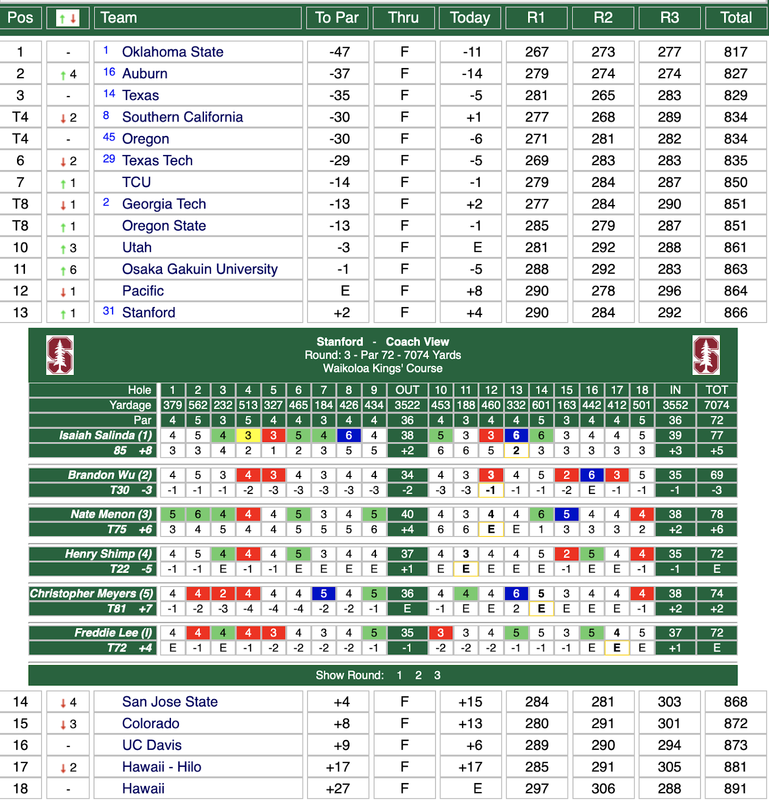 Stanford resumes competition in La Quinta, Calif. on Feb. 18-20 at The Prestige Presented by Charles Schwab. The 15-team tournament includes three of the last four NCAA team champions: Oklahoma State (2018), Oregon (2016) and LSU (2015). All three rounds will be televised on live stream. "Playing in warm weather against a top-flight field was a great way to knock some of the rust off," Ray said. "We're looking forward to competing at The Prestige." 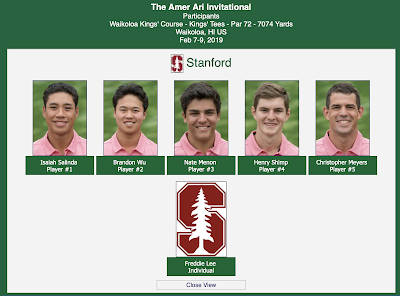 Stanford recorded three sub-par scores Friday and improved two places in the standings after two rounds of the 28th Amer Ari Invitational. Competing on the Kings' Course against a talented 18-team field, the Cardinal combined for a 4-under 284, six strokes better than Thursday. 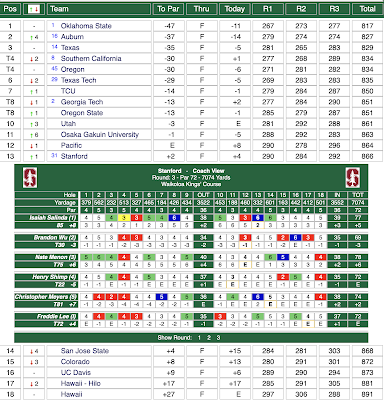 Stanford has a two-round total of 2-under 574 and is 14th. 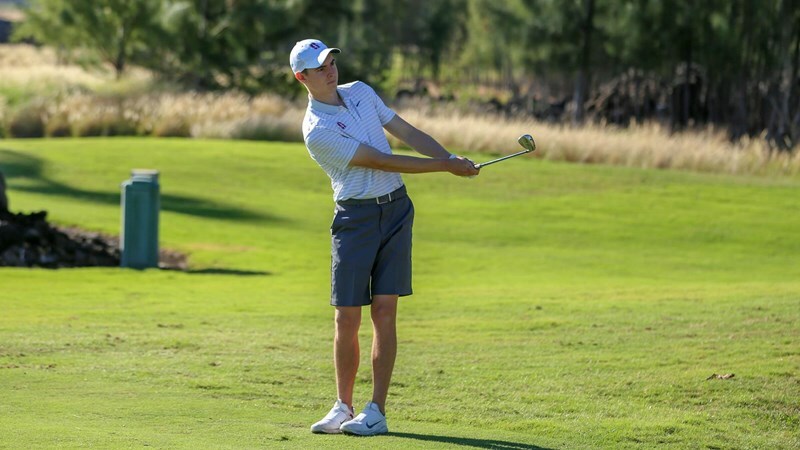 The Cardinal made an early charge, moving inside the top-10 behind a flurry of birdies and an eagle on the par-5 18th hole by senior Isaiah Salinda. 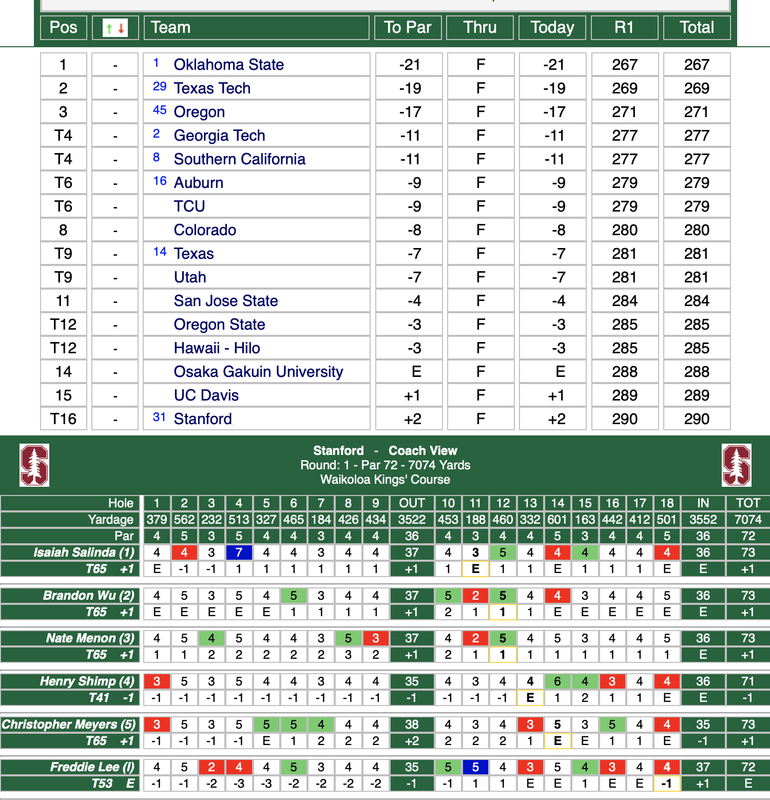 Top-ranked Oklahoma State leads the team race at 36-under 540, five strokes ahead of USC. For the second consecutive day, junior Henry Shimp paced the Cardinal with a 4-under 68, collecting five birdies and one bogey. He toured the front nine in 3-under 33 and is tied for 20th at 5-under 139. 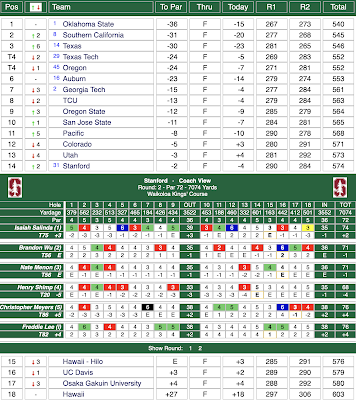 Senior Brandon Wu and sophomore Nate Menon contributed 1-under 71s. Wu rebounded from a rough start to post five birdies and the duo is knotted at 56th, even par for the tournament. Seniors Salinda (74) and Christopher Meyers (76) are tied for 75th and 86th, respectively. Participating as an individual, freshman Freddie Lee (76) is tied for 82nd. 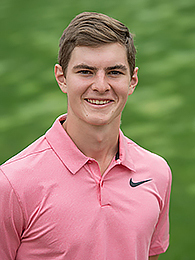 Cole Hammer of Texas is the individual leader at 13-under 131. The final round will be played Saturday, beginning with a 9:30 a.m. PT shotgun start. 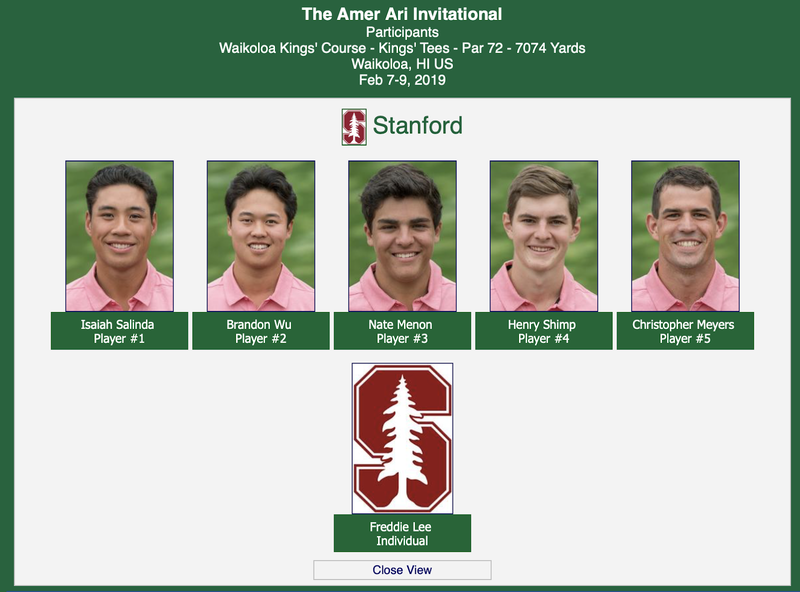 Junior Henry Shimp posted a 1-under-par 71 to spark Stanford on Thursday in the first round of the 28th Ari Amer Invitational at the Kings' Course. The Cardinal produced a score of 2-over 290 and is tied for 16th in the 18-school, 54-hole event, its first of the spring campaign. No. 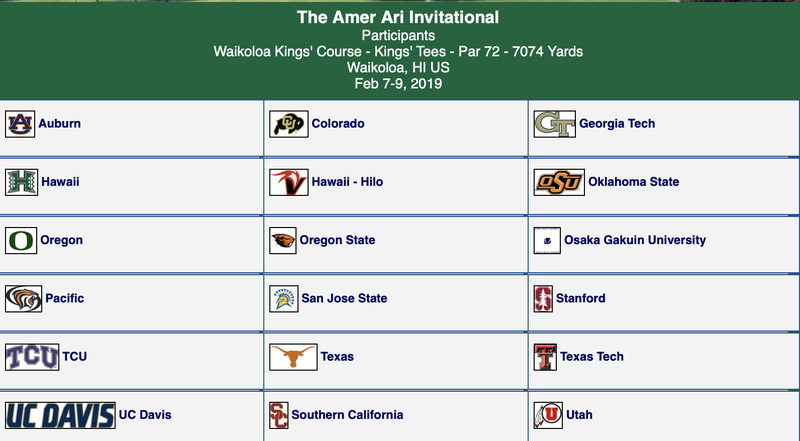 1 Oklahoma State blazed a 21-under total of 267 to pace the field. Shimp recorded three birdies and is tied for 41st. The remaining four starters – Isaiah Salinda, Brandon Wu, Nate Menon and Christopher Meyers carded 1-over 73s and are deadlocked for 65th. Freshman Freddie Lee, competing individually, fashioned a squad-best five birdies to shoot 72 and is tied for 53rd. 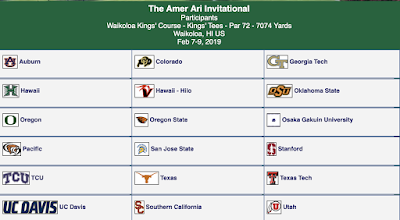 WAIKOLOA, Hawaii – The Stanford men's golf team begins its spring season in paradise on Thursday by participating in the 28th Amer Ari Invitational on the Waikoloa Kings' Course. Eighteen teams will compete in the 54-hole event. Other participating schools include Auburn, Colorado, Georgia Tech, Hawaii, Hawaii Hilo, Oklahoma State, Oregon, Oregon State, Osaka Gakuin, Pacific, San Jose State, TCU, Texas, Texas Tech, UC Davis, USC and Utah. Oklahoma State is ranked No. 1 in the country and won the 2018 NCAA title. 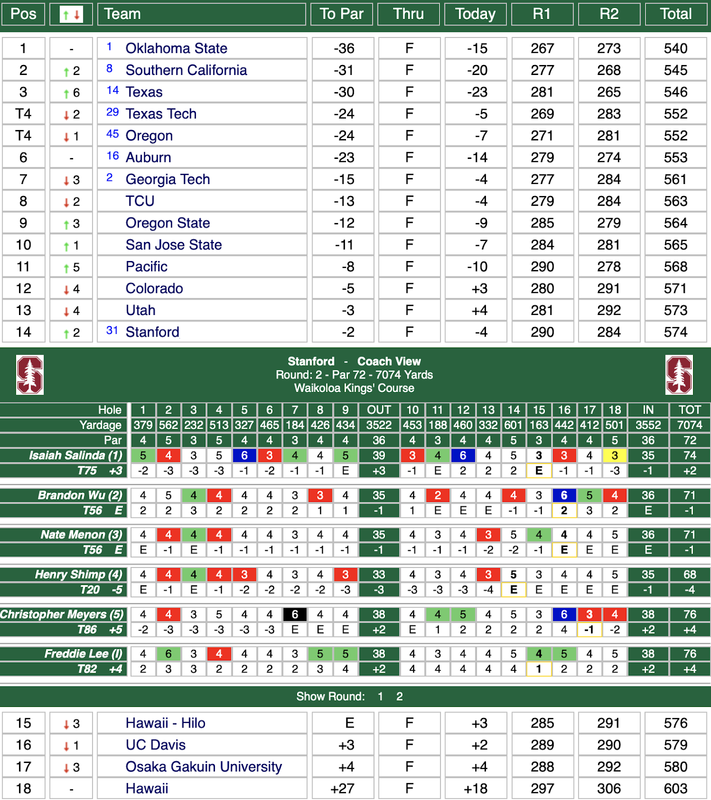 Last year, the Cardinal finished 10th behind senior Franklin Huang's 13th-place showing. Three current team members played last year and will represent No. 28 Stanford. Seniors Brandon Wu and Isaiah Salinda tied for 37th and 41st, respectively, and junior Henry Shimptied for 51st. They will be joined by sophomore Nate Menon and senior Chris Myers, while freshman Freddie Lee will compete as an individual. Wu led the Cardinal during the fall campaign with a 71.11 scoring average, followed closely by Salinda at 71.33. In the latest World Golf Ranking men's amateur ratings, Salinda is No. 22 and Wu is No. 34. Lined by palm trees, the par-72, links-style course will play 7,074 yards and trade winds are often a factor. Lakes, pot bunkers and lava outcroppings put a premium on accuracy. A 7:30 a.m. (local time) shotgun start will be held each day, with the final round set for Saturday.